Bori is a native Hungarian who came to Covenant Theological Seminary in August 2011, where she acquired her Master of Theology degree. She also has a MDiv and a MA in Classical Greek from Hungarian universities. 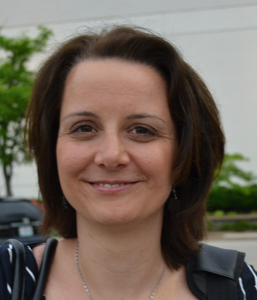 Bori returned to her church ministry work in Budapest in March 2013, and continues to serve the Reformed Church there. She also collaborates with several ministries dedicated to reaching Hungary with the Gospel of grace. These include theological editing for the Hungarian edition of the ESV Study Bible, guest lecturing at the Hungarian Reformed Seminary, training youth and church leaders with The Langham Partnership and with Serge's Sonship curriculum, and teaching teens about the Reformed faith in local public schools. The Reformed Church in Hungary is the largest Protestant denomination in Hungary, with over 1,200 congregations and a membership of over 1.6 million. Its history begins with the Reformation of the 16th century. Its doctrines and practices reflect a Calvinist theology. However, because communism closed the church from western theological influences for decades, the majority of the denomination and its seminaries lost relevance and struggle with communicating the authority of the Bible and the Gospel in a meaningful and winsome way. Bori is passionate about bringing the life-giving study of Scripture to the denomination, reaching people with a grace-filled Gospel, and teaching believers to engage their work and culture redemptively. To further her ministry, Bori is pursuing the Doctor of Ministry at Covenant Seminary, with a focus on cultural apologetics and communication. This degree work will take her to the States for seven 1-week courses over the next 3 years.